Jean Carolyn Sholar was born in Cadiz, Kentucky, the daughter of Robert Euel Sholar and Emma Goebel Cox Sholar. She was the fifth of seven children and the youngest of the three girls. The children grew up on a farm and their father worked for the telephone company, installing and maintaining lines over a wide area. Their mother was a teacher. When Jean was in elementary school, the family lost their farm due to the Depression, and they moved to Hopkinsville. The loss of the farm was a memorable and heart-breaking experience. Jean remembers her mother playing the piano while all of the furnishings of the house were moved out about her. The silver lining was the educational opportunities now available to the children. Jean became valedictorian of Hopkinsville High School, editor of the high school yearbook, and a member of the National Honor Society. She played softball, volleyball and tennis, and sang in the glee club. Next, Jean attended Bethel Woman’s College, a Baptist-affiliated junior college in Hopkinsville. She was valedictorian and Phi Theta Kappa president. Jean loved her time at Bethel, making many good friends and enjoying the opportunity to study a variety of subjects and explore some unknown gifts, such as fencing! Bethel students also traveled to Ridgecrest for Baptist student meetings, which was fun for the students. 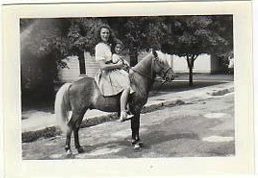 June Burr Goode was Jean’s best friend during her Bethel years and stayed in touch years afterward. They were fellow “town-girls” or day students. She remembers that Jean was President of the Phi Beta Kappa and influential on the campus. June Goode: During our final year at Bethel, I was one of two students who were considered for the Bethel Spirit Cup, awarded to the girl who best represented Bethel’s values. Both teachers and students were allowed to vote for the Spirit Cup winner. The students voted for June and the teachers voted for the other student Phyllis Kelly so the winner was unclear. Jean went to the faculty and other Bethel leaders to urge a repeat vote. She reminded them that the just saw one side of the students’ values, while the students themselves had a deeper view of their peers. A second vote was taken, and I was awarded the Spirit Cup. I did not know at the time how this had happened but was grateful. When I heard, I was doubly grateful to my friend. In 1949, Jean applied and was accepted to Wake Forest College in Wake Forest, North Carolina. Her sister Gwen and Gwen’s fiancee Bonner Blanchard drove her the long way to eastern North Carolina in his automobile. They arrived one day early but were granted accommodations. 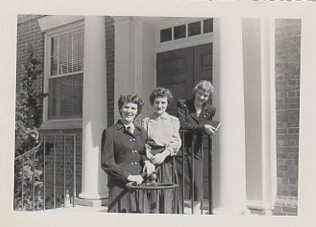 Jean’s arrival to Wake Forest College was captured in this snapshot in 1949. Jean (left) and sister Gwen (right) explore the campus just after their arrival. Gwen and Bonner went on to travel the world themselves, but this trip to take Jean to Wake Forest was momentous for her, and it changed her world. After graduation, Jean began teaching mathematics at high schools in Spring Hope, Bunn, and Youngsville, 1951-56 and then 1959-61, when she and Ed lived in Wake Forest, NC. She and Ed married on December 23, 1952. 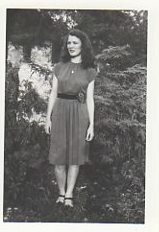 Jean attended graduate school at Duke University during the summers 1954-1956. Her time at Duke was quite enjoyable, and she became friends with Mary Partin from Edenton — a friendship of a lifetime. Jean earned a Master of Arts in Teaching (M.A.T.) 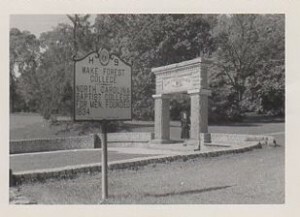 in September 1956. The theme of Jean’s life was her passion for education and the way it could improve individual lives and society.